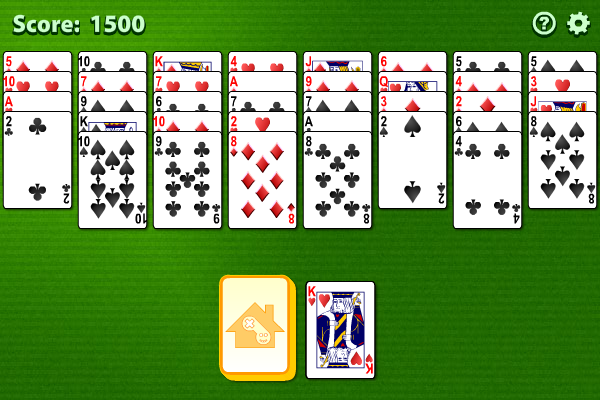 Connect as many moves as possible in order to solve Golf Solitaire! In this game, 40 upturned cards will be evenly divided into 8 tableau piles, while an upturned card serves as the discard pile under the tableau piles, and the remaining downturned cards are placed on the left of the discard pile and serve as the stock pile. Your goal is to move all cards on the tableau piles to the discard pile before the stock pile runs out. The rankings of the cards are from K to A regardless of suits. You may click and move a card from a tableau pile to the discard pile if the moving card is of an immediately higher or lower ranking than that of the topmost card on the discard pile regardless of suits, for example, when a 3 of diamonds is on the discard pile, either a 2 or a 4 of any suit can be placed upon it. Continue the process until no further moves can be made, then you can click the stock pile to deal a new card. The game ends when the stock pile is used up but no more steps can be taken. Each card you move may well affect the result, so be careful when you make your choice! GOLF SOLITAIRE - PRODUCT LICENSE INFORMATION NOTICE TO USERS: CAREFULLY READ THE FOLLOWING LEGAL AGREEMENT. USE OF THE SOFTWARE PROVIDED WITH THIS AGREEMENT (THE "SOFTWARE") CONSTITUTES YOUR ACCEPTANCE OF THESE TERMS. IF YOU DO NOT AGREE TO THE TERMS OF THIS AGREEMENT, DO NOT INSTALL AND/OR USE THIS SOFTWARE.